In the Lausiac History by Bishop Palladios of Helenopolis, we read about two holy figures who were contemporary ascetics in the fourth century Egyptian desert. The first is Saint Serapion the Sindonite ("of the Girdle"), who is celebrated by the Church on March 21st, and the other is Saint Thais, or Taisia, who is celebrated on October 8th. It is believed by some that it was this Serapion who converted Thais and directed her in her repentance after living a life of harlotry. However, when we read the story of Thais in the Lausiac History, we usually do not read that it was Serapion who converted her. Rather, if we read a Syriac translation of the text, we come across the name "Bessarion". This story is told in Book 1, Chapter 30 of the text. However in Book 2, Chapter 36 of the Syriac text, we read of the conversion of an anonymous harlot by Abba Serapion, who is believed to be the Sindonite, and while this story bears resemblances with the conversion of Thais, it also has slight differences. The solution to this may lie in the Greek text. There, instead of Bessarion, we read either of a Paphnutios or a Serapion as being the one responsible for the conversion of Thais. Some authorities identify this Serapion with the Sindonite. Albert Gayet (1856-1916) was known as the “archaeologist of Antinopolis” and, without his extensive research and documentation of the site, very little would be known about this Greco-Roman city. His findings confirmed that the Egyptian city of Antonopolis, or Antinoe, was home to many Christian nuns and monks and sanctuaries were popping up everywhere. 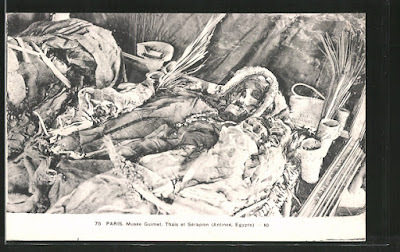 In 1899-1900 Gayet carried out a series of excavations here, and in the course of his work discovered the tomb of a woman which contained baskets made of plaited reeds, a chaplet made of wood and ivory, an object in the form of the ancient Egyptian symbol for "life" (the crux ansata), palm branches, and a rose of Jericho. In the tomb, roughly traced in red ink, was the name of "Blessed Thais". In a neighboring tomb was found a fragment of pottery, on which was inscribed the word "Serapion". We know Thais was buried in Egypt, however in the Lausiac History it says Serapion the Sindonite was buried in Rome, where he died. 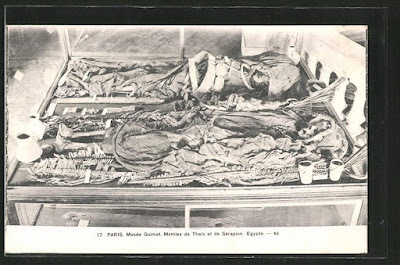 Now it is possible his relics were brought back to Egypt and buried with Thais. It is also possible that it was another Serapion who converted Thais (like the Bishop of Thmuis), or perhaps it was not their relics at all. In 1901 Albert Gayet announced the discovery of the mummified remains of Saints Thais and Serapion. These remains were placed on display at the Musée Guimet in Paris, and in a stunning display, Gayet staged the resurrection and entombment of Thais before the eyes of his enchanted audience. In his published account of the results (Antinoë et les sépultures de Thaïs et Sérapion, 1902) Gayet takes a more cautious attitude: responding to the criticism that he was said, on one day, to have identified the legendary Thais with the remains he had uncovered, only to deny this claim the next day, he writes, for the record, "I have no convincing document that would allow me to identify the bodies exhumed from the necropolis with the historical Serapion and Thais. Neither do I have any authorizing me to claim the opposite; under these circumstances, loyalty forbids me to pronounce." Nonetheless it is clear where his own heart lies and the remainder of his essay seeks to establish grounds for believing in the possibility, at least, of the identification. Towards the conclusion he takes the audience on what might today be called a "visualization", a recreation in heightened romantic prose of the site as it would have been perceived by Thais and Serapion in the fourth century: "Who was this Serapion?" wonders Gayet, "Without doubt, one of those unknown solitaries, withdrawn into the ideal mountain of dreams which is the mountain of Antinoe, so hollowed out with grottoes that one might call it one immense beehive." The bodies remain at the Musée Guimet at Paris. Though the identification of them remains uncertain, it is not difficult to wish that the remains of the Saints are indeed side by side at the Musée Guimet. One day it may eventually be proven.